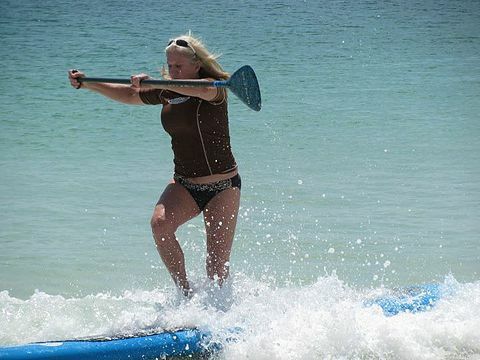 Home » Interests » Adventure » SUP: I’m a water warrior! SUP: I’m a water warrior! 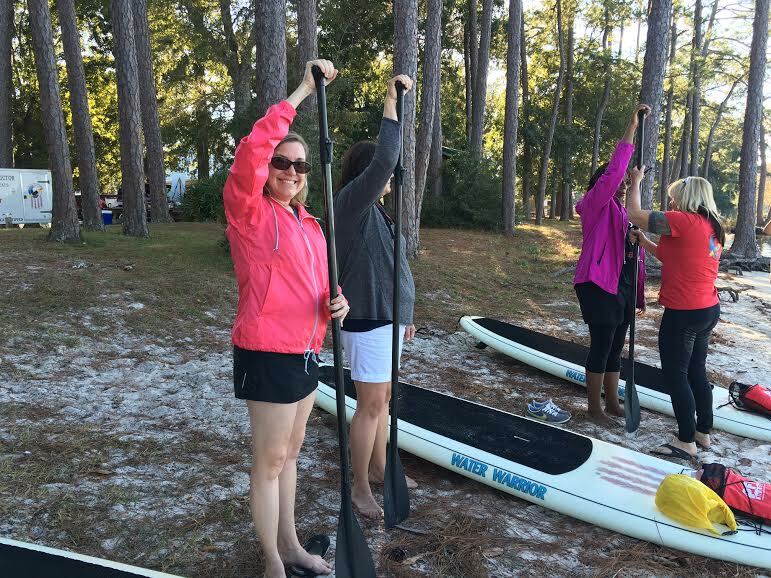 On my last visit to Gulf Shores and Orange Beach, I had a stand-up paddle (SUP) boarding lesson with Becky Harger, owner of Water Warrior and teacher extraordinaire! We met up with her in Wolf Bay, which provides calmer waters than the gulf — great for us newbies. Becky Harger, teacher, encourager, warrior! Before we got anywhere near the water, Becky taught us about the ecology of the area, covering things like where the sand comes from (the mountains all the way up in Maine), sea turtle conservancy efforts, pollution, native marine life, rip currents and how to handle jellyfish stings. Ecology lesson done, we moved down to the edge of the water for the SUP lesson. She explained the parts of the board and how they make SUP easier (like the grippy surface and the marking for the center balance point). Then, she taught us how to fall off the board safely (a lesson I actually needed and found helpful in real life). Finally, she explained which muscles we should be using (all of them — especially the core muscles) and why. 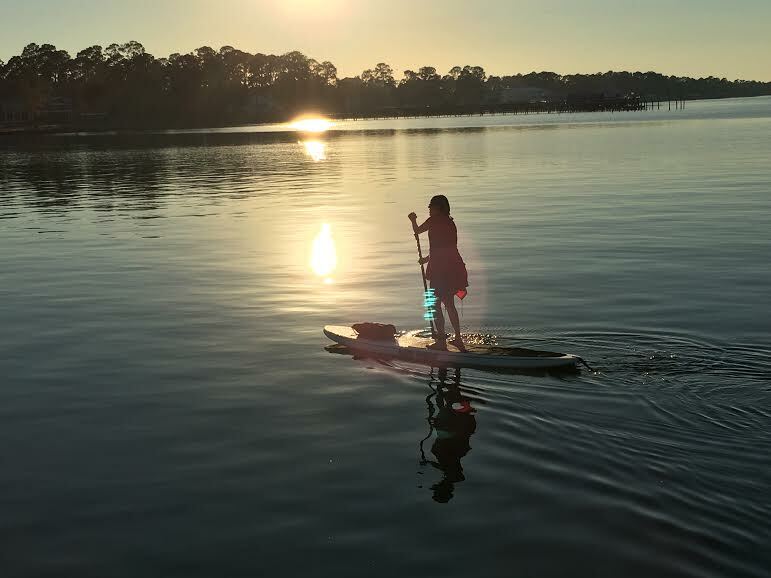 Since I was the only one who had ever been on a SUP before (no lessons and definitely without proper technique), I got to be the guinea pig. We stepped into the water, and I knelt on my board and paddled away from shore. Once everyone else was in the water, we started paddling out into the bay. You can SUP on your knees, but it hurts! That grippy board is rough! AND, because the oars are designed for people to stand, it’s a lot harder on your shoulders. I decided to stand up, but I forgot one key point: Go FAST! So, as I raised myself from kneeling to standing, my leg muscles shook. I couldn’t get my center of balance and fell over backwards into the bay. It was late November, y’all, and I expected the water to be REALLY cold. Luckily, it was just cold. Also lucky, there are no photos of my tumble! Pride hurt a bit, I grabbed the board and pulled myself back up. I got balanced on my knees and set off again. Get moving. It’s easier to balance. Plant one foot where it’s supposed to go. Shove the paddle into the water for balance. And I was up. My legs quivered as I tried to engage my core muscles. But, I got it!!! I paddled out into the bay and kept my balance even when the speedboats rode by. Later, as I returned to shore, I felt such a sense of accomplishment — I’d become a water warrior! 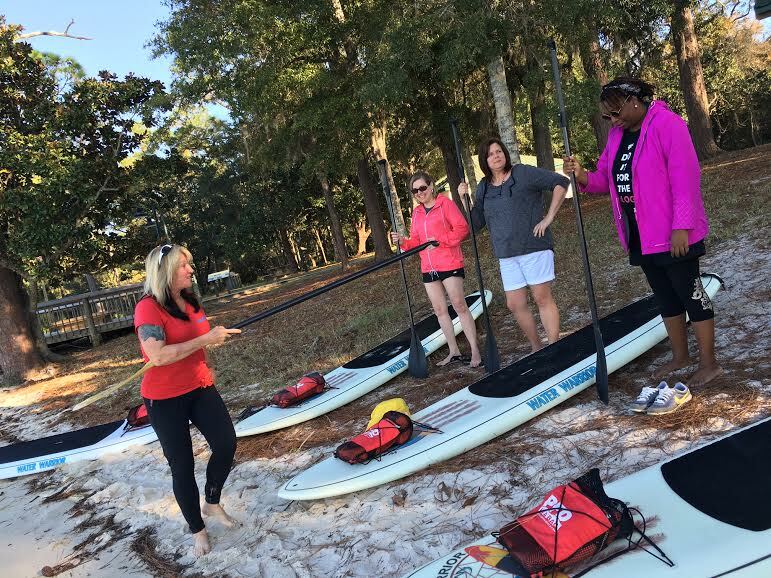 Contact Water Warrior in advance to schedule your lesson: Becky Harger, supnwarrior@gmail.com, 225-333-1357. 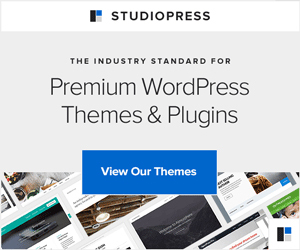 Prices and packages are available online. Come prepared: Swimsuit and t-shirt, waterproof camera, sunscreen, sunglasses. Becky provides: water and/or gatorade, sunglasses straps (phew), boards, paddles and life jackets.